Caffarel, C., Lozano, C., Gaitán, J.A. and Piñuel, J.L. (ed) (2018). Investigation, Communication and University, pp. 232. Salamanca: Social comunication. Izquierdo, P. (2018): The scientific method and logic methodological. Introduction to the subject communication research methods (I). Albacete: Editorial ONE. ISBN: 978-84-17256-43-2. Rubira, R., Puebla, B. and Magro, S. (2018): "Communication Processes in educational settings". Sevilla: University of Seville and Egregius Editions. ISBN 978-84-17270-59-9. Torregrosa, J.F. and Agustín, M.C. (2018): Ways of looking. Informative and documentary uses of photography. Trea. Gijón. Caffarel, C. (2018). conclusions, in Piñuel (to you), Investigation, Communication and University, pp. 105-112. Salamanca: Social comunication. Caffarel, C. Gaitán, J.A., Lozano, C. and Piñuel, J.L. (2018). Communication research in Spain: a problem for its researchers. In Rodriguez Serrano, A. and Gil Soldevilla, S. (eds.). Researching the neoliberal era. Critical views on communication research in Spain, pp.295-320, Global village, UAB, TEST, UPF, UV. García, A. (2018): The participation of children and empowerment Internet. In: Estefania Jimenez; Maialen Garmendia and Miguel Angel Casado (coords.) Among Selfies and Whatsapps. Opportunities and risks for children and adolescents connected, pp. 227-249, Gedisa. Barcelona. García, A. and Catherine, B. (2018). Perspectives on communication technologies and digital citizenship. In: J. Ignacio "Iñaki" keys (coord.) Communication and citizenships, p. 25-41. Bogotá, Editions From Below. Izquierdo, P. (2018): educational potential of ICT as digital uses of young people and the status of materials. In: Chaves-Montero, Alfonso (Ed. ): ICT as a learning platform and educational innovation in the classroom. Sevilla: Excellent. ISBN 978-84-17270-07-0, pp.28-42. Ortiz Guinea, Y. and Martin Sáez, J.L. (2018). The evolution of professional routines television journalists. New technologies and transmedia content: For Telemadrid. In: José Muñoz Jiménez, Silvia Martínez Martínez and Beatriz Peña Acuña (Coords.) The reality audiovisual communication as a new vehicle (2), pp. 345-358. Editorial Gedisa. ISBN: 978-84-17341-96-1. Caffarel, C. (2018). The communication metainvestigación, a need and an opportunity. In: adComunica. Scientific journal Strategies, Trends and Innovation in Communication, nº15. Castellón: Association for the Development of Communication adComunica and Universitat Jaume I, 293-295. Caffarel, C., Gaitán, J.A. and Ortega F. (2018): Communication Research in Spain: Weaknesses, Threats, Strengths and Opportunities, To communicate, n.56, vol.26. pp. 61-70. Ortiz Guinea, Y. Villafañe, J. And Caffarel, C. (2018): "Research for assessing the reputation of the media". Latina Magazine Social Communication, 73, pp. 845- 869. Ortiz Guinea, Y. and Martin Sáez, J.L. (2018). Level academic research on graphic design in Spanish (2014-2018). Archetype, 17, 141-153. Rubira, R., Puebla, B. and Gelado, R. (2018). Social Representations in Studying Information, Knowledge, and Mediations: A Critical Review. Social Sciences 7 (12). Rubira, R. and Puebla, B. (2018): Social representations and communication processes: Theoretical notes for an unfinished interdisciplinary dialogue. in Convergence, Social Science Journal. Autonomous Mexico State University. Torregrosa, J.F. and Montes, M.J. (2018): The claim of the women's bodies as a sexual object in graphic advertising. Comparative study of two jewelry brands. In: Mediterranean Journal of Communication, vol 9, nº 1, Alicante. Torregrosa, J. F., Martínez, M. and García, M. C. (2018): job placement and job satisfaction in grades Communication adapted to the EESS. A case study. The information professional, November December, v. 27, 6, pp. 1283-1292. Barcelona. Caffarel, C. and Garcia de Castro, M. (2017). The Future national and regional public television in Spain. Proposals of Political Parties in 2015 and 2016 Elections. Mediterranean Journal of Communication, vol. 8 (1), pp.105-119. Caffarel, C., Gaitán, J.A. and Ortega F. (2017). Communication Research in the Spanish University in the period 2007-2014. The information professional. 26, n. 2, pp. 218-227. Rubira, R. and Puebla, B. (2017): Internet study Social Sciences and Communication: a critical perspective. SPACES, Vol. 38, Nº 52. National Council of Scientific and Technological Research (Venezuela). Rubira, R. and Puebla, B. (2017): Social representations and mediations: a critical reading from a Latin American perspective Communication. in Barataria, Castilian-Manchego Journal of Social Sciences, Nº 22, pp. 81-9. Rubira, R. and Gil-Egui, G. (2017): Wikipedia as a space for discursive constructions of globalization. International Communication Gazette. Torregrosa-Carmona, J. F. and Rodriguez-Gomez, E. (2017): Communities of Fans and Television Fiction. Case Study: time ministry (TVE).The information professional, vol 26, 6, pp. 1139-1148. Barcelona. García, A., Catalina, B., and Beltran, P. (2016): Documentation Communication. Introduction and new tools. Ommpress, Madrid. Izquierdo, P., Peñafiel, C. and Torres, E. (2016): qualitative perception of university research managers in communication through a Philips 66 , in: Herrero, Javier and Mateos, Concha (Coords. ): The verb to bit, pp.790-810.The lagoon, Tenerife, Ed. Sociedad Latina Social Communication. ISBN-13: 978-84-16458-41-7. Caffarel, C. and Garcia de Castro, M. (2016). "Effects of the economic crisis in content production of television fiction in Spain between 2010 and 2015 ". WHAT, Journal of Communication Studies, 21, nº 40, pp. 177-193. 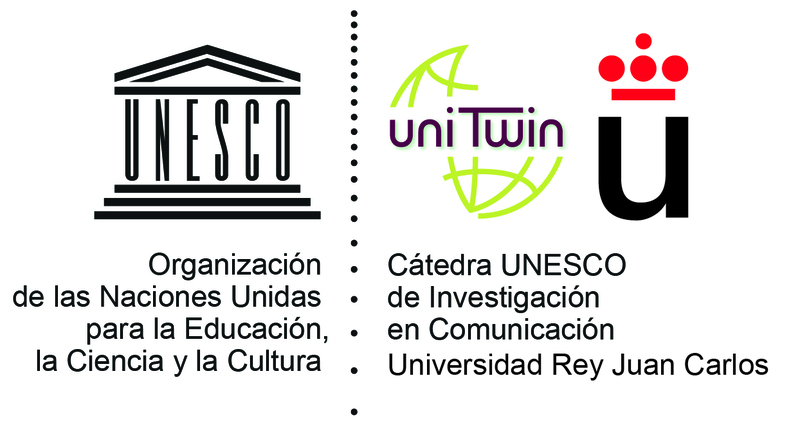 García, A., Marzal, J and Humanes, M.L (2016): Analysis and reformulation of the organization of knowledge in Communication Sciences: encoding application for Unesco. Magazine General Information and Documentation, vol. 26, nº 1, pp. 65-79. Izquierdo, P., Martínez, E. and Galmes, M. (2016): Ethnic representation in Argentina advertising, Brazilian and Mexican (2012-2014). Social Prisma. Social Science Journal, nº 17, December 2016-May 2017, pp. 241-267. García, A. and Rubira, R. (2015): Africa: Communication on Human Rights, So close and yet so far. Sociedad Latina Social Communication. The lagoon, Tenerife. ISBN-13: 978-84-16458-04-2. Left-Iranzo. P. and Barley-Romero, A. (2015): Green voices: speeches of journalists and Tanzanian women leaders on climate change. Journal of the Spanish Association of Communication Research, vol. 2, number 4, pp. 19-26. Ortiz Guinea, Y. (2015): "Journalism and reputation of journalists in times of crisis". In: Index.comunicación. Scientific Journal of Applied Communication, v. 5, n. 2, pp. 83-100. Rubira, R., Núñez, S, and Fernandez, Mr. (2015): Online activism and subject construction of the victim of gender-based violence on Spanish YouTube channels: Multimodal analysis and performativity. En European Journal of Women's Studies. Torregrosa-Carmona, J. F. (2015). What training do journalism. Towards a curriculum up to the current challenges of the profession. Index.comunicación: scientific journal in the field of Applied Communication, ISSN-e 2174-1859, vol. 5, Nº. 2., pp. 63-81. Sendín-Gutiérrez, J. C. and Torregrosa-Carmona, J. F. (2015). Training of journalists in the proposed curriculum UNESCO. Option: Journal of Humanities and Social Sciences, ISSN 1012-1587, No.. 2, pp. 1019-1040. Torregrosa-Carmona, J. F. Gaona and Pisonero, C. (2014). Relations between journalism and literature in the twentieth century Spain. In: Communication through history, ISBN 978-84-15965-87-9, pp. 443-454. Caffarel, C y Sendin, JC (2014). "Democracy and the Media in Africa: 2010-2011 Ivory Coast Political Transition", The Challenges of Information and Communication. pp. 91-100. Grenoble University. France. Izquierdo, P. (2014). Physiognomy of ethnicity and gender in advertising discourse. Electronic Directory of Social Communication Studies Discourses, Vol 7, Number 2, pp. 178-209. Rubira, R. and Santín, M. (2014): Promotional Practices in News programmes: The Case of Spanish Public Television. In International Journal of Communication. Vol 8, pp: 810-829. Annenberg School for Communication & Journalism, University of Southern California. Rubira, R., Carrillo, E. and Puebla, B. (2014): An approach to identity elements in the design of brands for entertainment programs on television. Case Study "Tele Factory ". Creativity and Society, Journal of the Association for Creativity (ASOCREA), Nº 22. Rubira, R. and Puebla, B. (2013): Corporate identity, corporate image and mental image: towards a dialectic of corporate communication. In Discover Magazine mkt: Commercialization, Research and Business. Vol 3. Registro ISSN – 1390- 7352 and Registration No. IEPI. 3232-12. Rubira, R., Puebla, B. and Carrillo, E. (2013): communicology: old commitments, Traditional science and critical perspective. Barataria, Castilian-Manchego Journal of Social Sciences, Nº 16, pp. 149-160. Rubira, R. and Gil-Egui, G. (2013): Political Communication in the Cuban Blogosphere: A Case Study of Generation Y. Global Media and Communication. SAGE Publications Ltd, vol. 9, Nº. 2, pp. 153-178. Torregrosa-Carmona, J. F. (2013). An approach to media education in Africa. Index.comunicación: scientific journal in the field of Applied Communication, ISSN-e 2174-1859, vol. 3, Nº. 2, pp. 53-66. Torregrosa-Carmona, J. F. (2013). On the role of journalists in times of disaster. Index.comunicación: scientific journal in the field of Applied Communication, ISSN-e 2174-1859, vol. 3, Nº. 1, pp. 285-287. Torregrosa Carmona, J. F. (2013). Freedom of public communication and its limits in the Spanish legal system. Derecom, ISSN-e 1988-2629, Nº. 12. Torregrosa Carmona, J. F. and Lopez Branch, J. (2013). productive routines in Spanish digital newspapers: characterization and development in the dynamics of convergence. areas: International Journal of Communication, ISSN-e 1139-1979, Nº. 22, pp. 111-120. García, A. (2012): Communication, childhood and youth. Situation and investigation in Spain. Convention, Barcelona. Izquierdo, P. y Boned, A. (2012): Tina Modotti: Communication, Art and Political Commitment. Art and City - Journal of Research. Nº 1, April 2012, pp. 221-239. Rubira, R., Núñez, S., Vazquez, S. and Fernandez, Mr. (2012): feminist practice online against gender violence in Spain. Effective political practice of female agency on the Net. in Telos: Notebooks communication and innovation, Nº. 92, pp. 60-69. Torregrosa-Carmona, J. F. (2012). An approach to the educational possibilities of the use of radio in the classroom. classroom: Digital Journal of Communication, ISSN-e 2253-7937, vol. 1, Nº. 2, 2012, pp. 171-177. Torregrosa-Carmona, J. F. (2012). Elements for social recovery of journalism. Index.comunicación: scientific journal in the field of Applied Communication, ISSN-e 2174-1859, vol. 2, Nº. 1, pp. 171-173.